Just letting everyone know that I will be making more prints of this piece from my fall show. 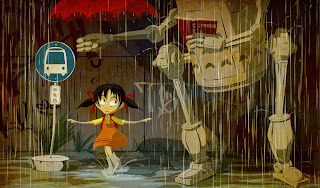 It's called Totoro the Protector, inspired but the Miyazaki classic My Neighbor Totoro. If you're interested send me an email. Large 10 x 17 inches for $100US and small 7 x 12 inches for $40US. + shipping. Archival ink on acid-free artist's paper. Many artists out there have had a friend or family member ask them to illustrate a children's story they wrote. I'm no stranger to this request. The fact that I haven't done it doesn't mean that I didn't feel the stories were great. My sister Tori and a friend named Jordan have penned a couple of nice stories. Fact of the matter is, I just haven't had the time. This piece is in honor of these requests. I know it has nothing to do with either of those stories mentioned but it has that old-school children's book feel. Hope you enjoy. 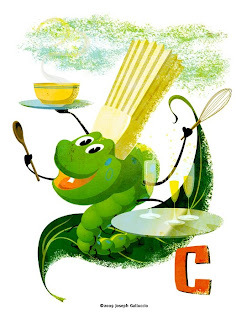 As they say on "Sesame Street", this one is sponsored by the letter "C"! Some of you may remember the little holiday short I made that stars the incarnation of my shy niece. I decided to do a background piece of Betty's hood. I might do the Yeti's soon. Have a great week and let's all do our part to get the economy started...I might even pray. You can watch the short here.